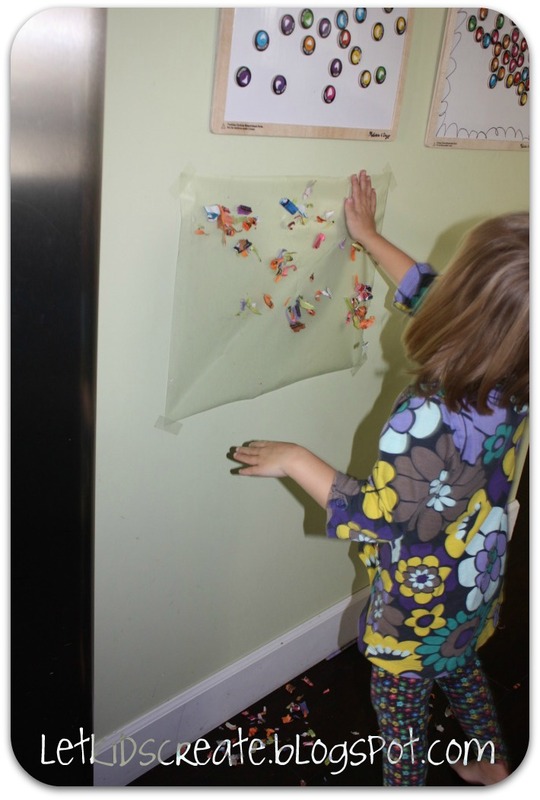 The activity for day 13 of the Hands on Play Challenge was to create sticky art. I decided to pull out some contact paper for Mina to play on while Maisy was at school. But we just couldn't get our toothpicks to stick. I don't know if it's because our contact paper wasn't the brand name. Apparently it just wasn't sticky enough. Fortunately, I had been saving some of our crayon wrappers for another idea I had seen on Pinterest, but never gotten around to. 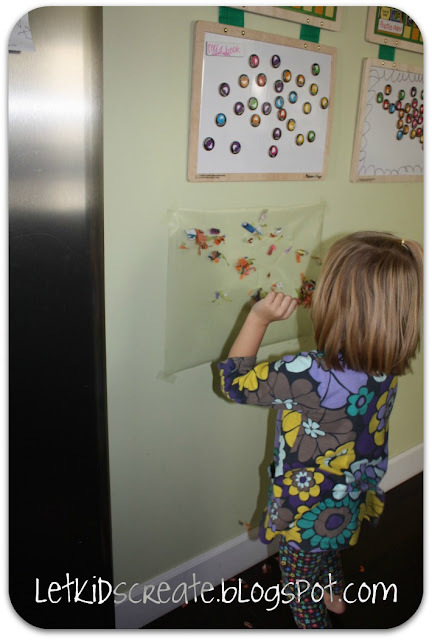 Mina loved sticking all the different colored papers on to the sheet. 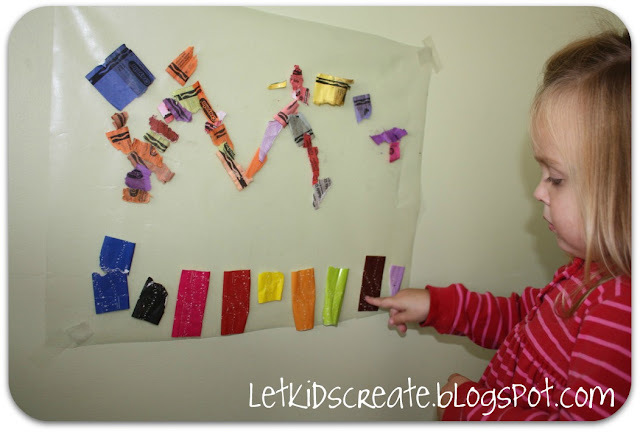 She liked naming all the colors and counting how many she had put onto the sheet. I helped her to make an "M" on the sheet. Of course when Maisy came home from school she wanted to join in the fun, too. She had her own ideas on how to do her collage - just throw it on and hope it sticks. Or else just smack it on. When the girls were done with their creations, I cut to fit another piece of contact paper to seal it up and then stuck them to the window. Making collages with contact paper is so much fun, but the best part about it is that it's mess-free. 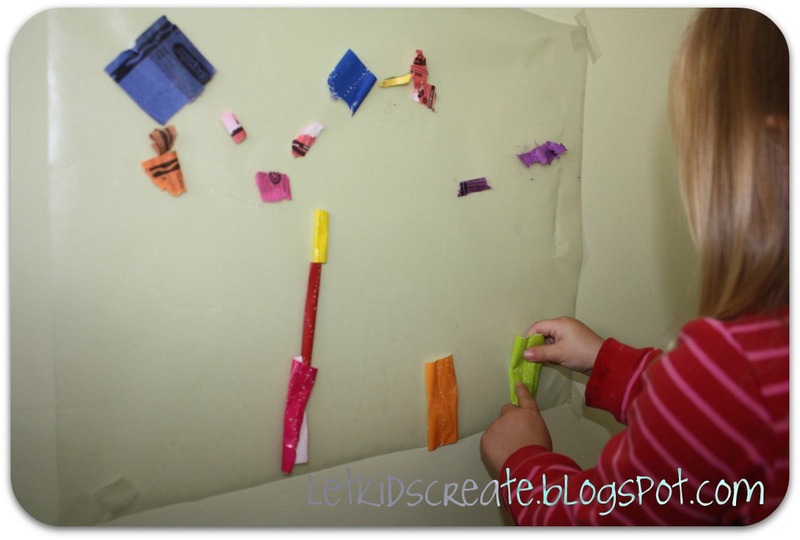 What other materials do your kids like to stick to contact paper when making a collage? Love contact paper art--I'm a two-year old teacher. 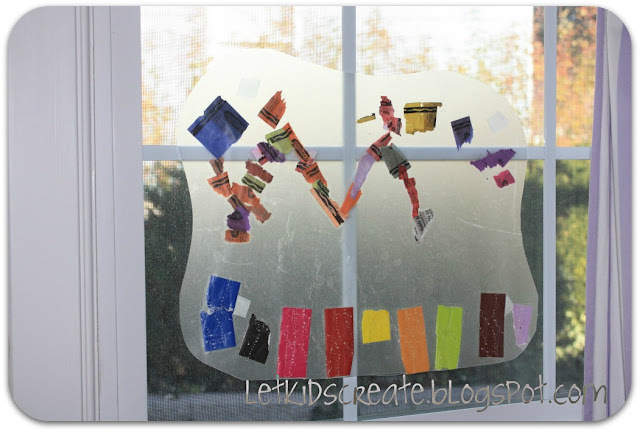 Squares of colored cellophane make an awesome stained glass look and tissue paper is cool too! I save candy wrappers.they come in so many colors and designs. Looks like fun! My little guy loves to rip the paper off of his crayons, now I have an idea for an activity he can do with the wraps other than make a mess! I teach Science to 5 years. 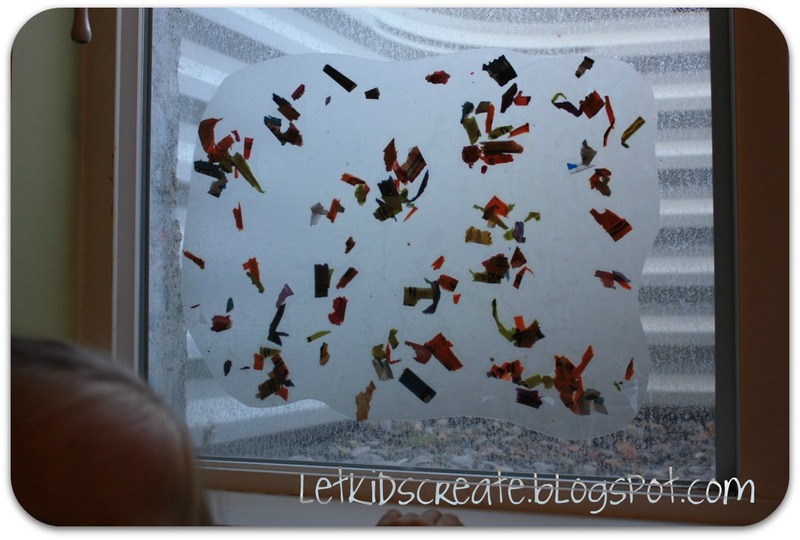 We did it with leaves and small yard pieces, cut the paper on a "Heart" shape and stick it to the window over the classroom exit door. 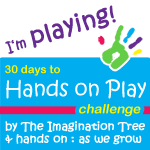 This way we made a compromise to take care of nature during our free outdoor play. I love the use of the crayon wrappers. My kids always love ripping off the crayon wrappers. I LOVE the toothpicks and contact paper; I hope that ours stick when we try it. I also love the idea of using recycled papers, too! For the "M" or other letter in the alphabet, you could tape a piece of paper with the chosen letter and tape it behind the contact paper. Then the child could "trace" it with the crayon papers or whatever they decide to use. So I think it's pretty *genius* that you used crayon wrappers!